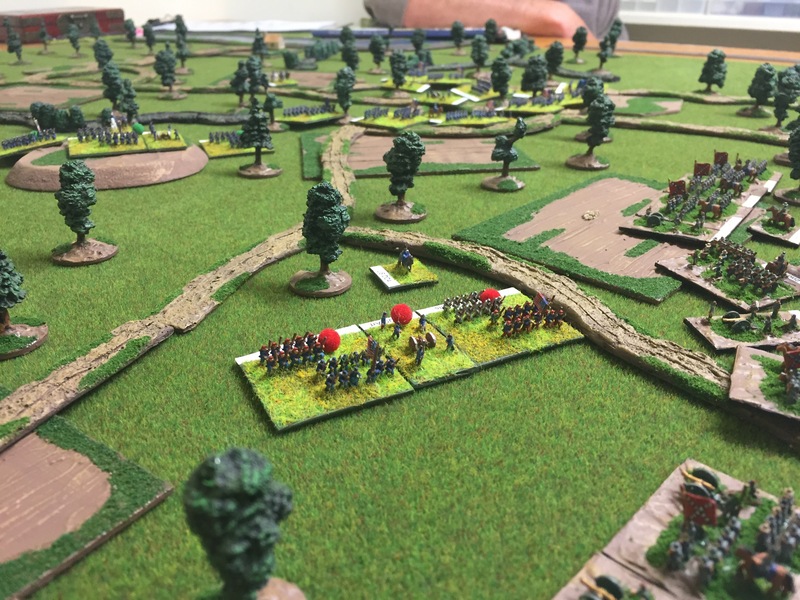 Recently, while considering it was time to organise a game for a Friday evening, it occurred to me that the 6th and 7th of April was the anniversary of the Battle of Shiloh. Spurred on by this realisation I set about organise a refight on one of my regular Friday evening gaming slots. A few emails later we had four players available for a multiplayer game covering the first day. Shiloh is ideally suited to an evening game. What is the appeal, well there are several. Firstly of course the forces are modest, each army comprises around six or so divisions with some 45,000 Confederates around 48,000 Union troops excluding the Army of the Ohio. 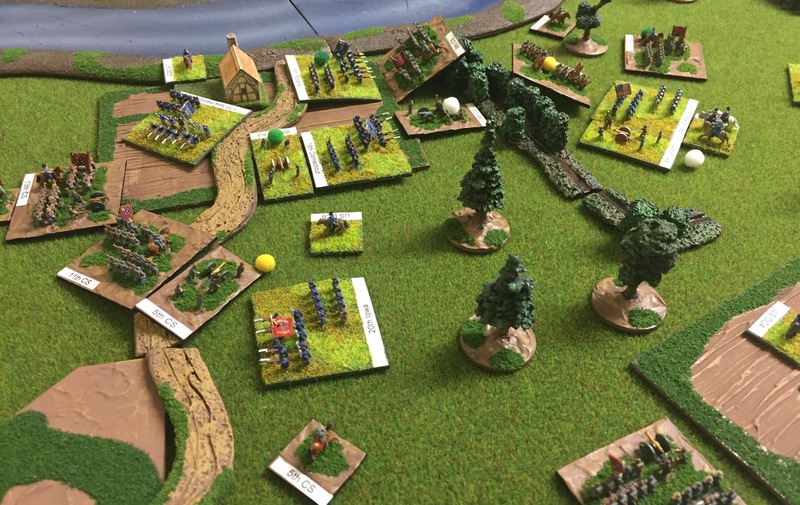 Then of course the terrain, with woods covering most of the battlefield, creates a very different battlefield. Finally of course is the game balance. Despite the fact I have refought the battle many times it continues to provide challenges. 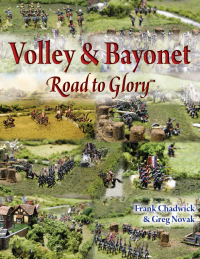 Interestingly the Volley & Bayonet scenario was new to a couple of players which would add further interest. 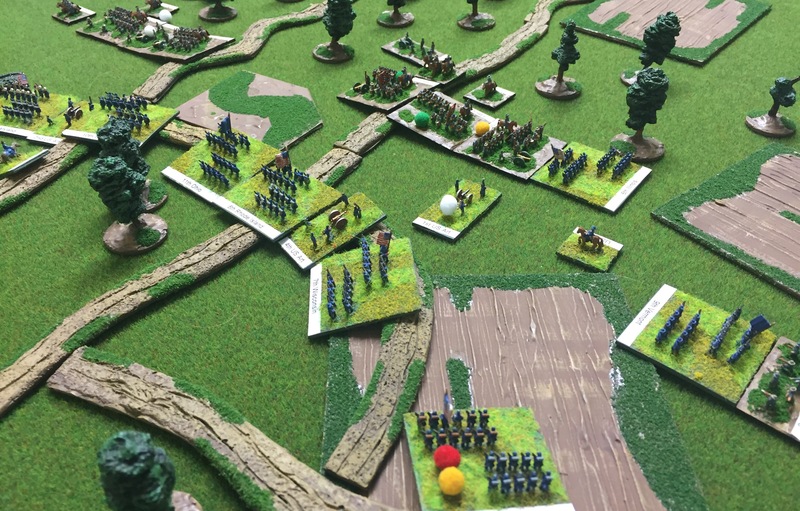 As mentioned the scenario features a battlefield predominately covered with light woods, with a few clearings. In the northeast is Pittsburg Landing, located on the banks of the Tennessee River. 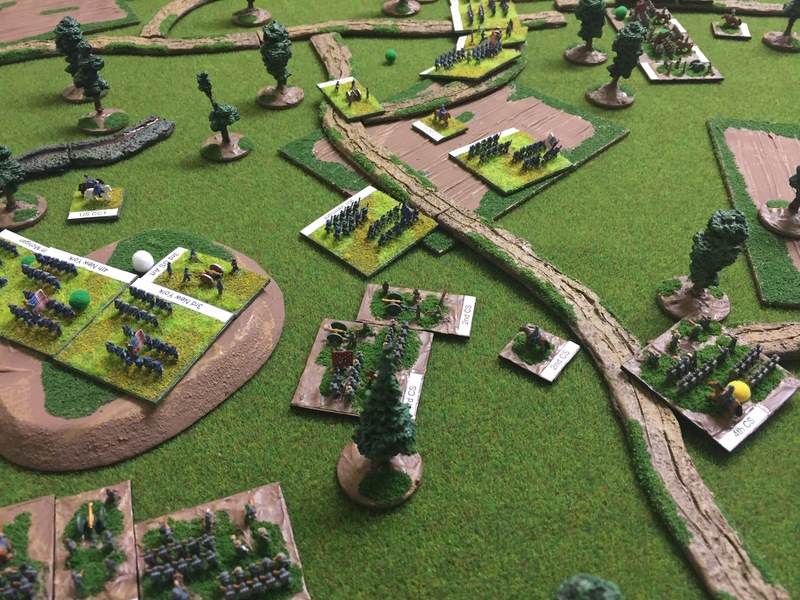 The Rebels advance from the south and initially have an ability to potentially destroy two Union Divisions posted forward in unsupported positions. Then, pressing forward, they may well destroy the remaining elements of the Union Army of the Tennessee. But time can also slip away for the Rebels, in part due to the troops being raw recruits and are therefore difficult to manoeuvre. The battle, well the first day at least, starts at 7am and runs until the end of the 7pm turn. In our refight the Confederate commanders, A.S. Johnston and Beauregard, determined to deploy west to east and attack on a broad front, rather than an attack from the southwest. As a result the divisions of Sherman and Prentiss were engaged frontally in strength soon after 7am, as shown above. It seemed likely that both divisions would be driven back quickly. Prentiss’ Division, above, managed to deliver a withering fire on the attackers, and by 8am had recovered from their initial surprise. This division would continue to perform valiant service despite being eventually surrounded by two Rebel divisions. Indeed, it was around 10am before the Prentiss’ Division finally succumbed to repeated attacks and broke. In the process however Ruggle’s Division, from Bragg’s Corps, had been also been driven into exhaustion. 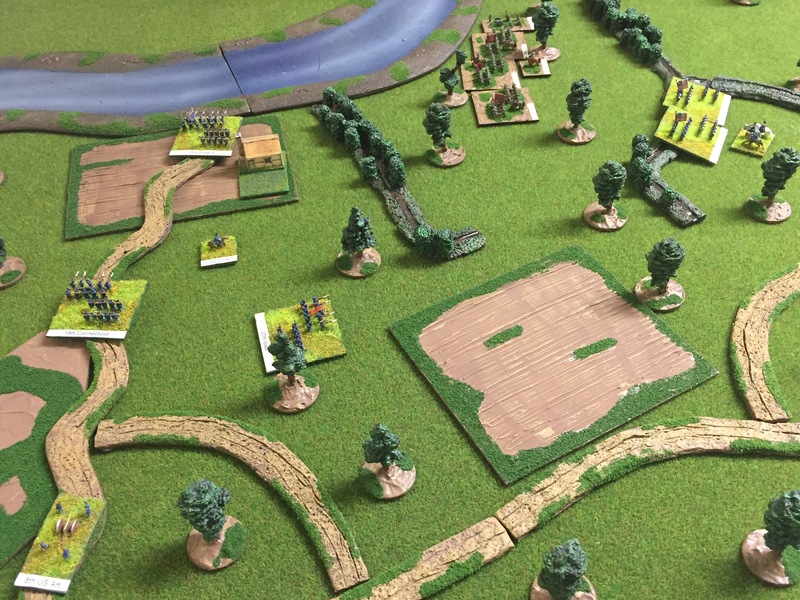 A costly result for the Confederate centre. 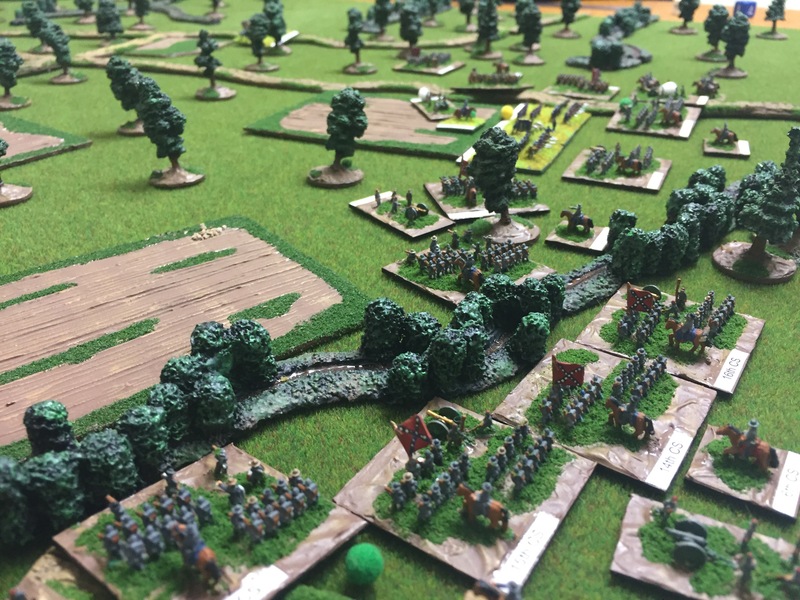 Shermans Division lining the Shiloh Branch, a small creek that meandered its way east from the west table edge, wavered as Rebel artillery deployed in the trees supported by Rebel infantry. The casualties quickly mounted. Likely to be outflanked on his right flank Sherman was soon forced to retire his now collapsed division. Having retired around 1200 yards the remains of the division formed up again in an effort to delay the advancing Rebels. There efforts were in vain as Rebels soon poured through the woods. 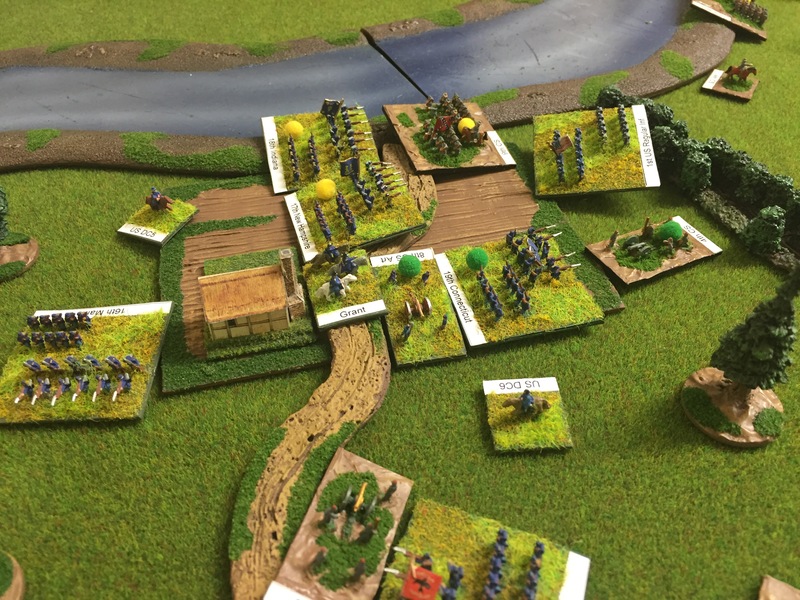 Two brigades evaporated at first contact, another routed further where it was finally rallied. 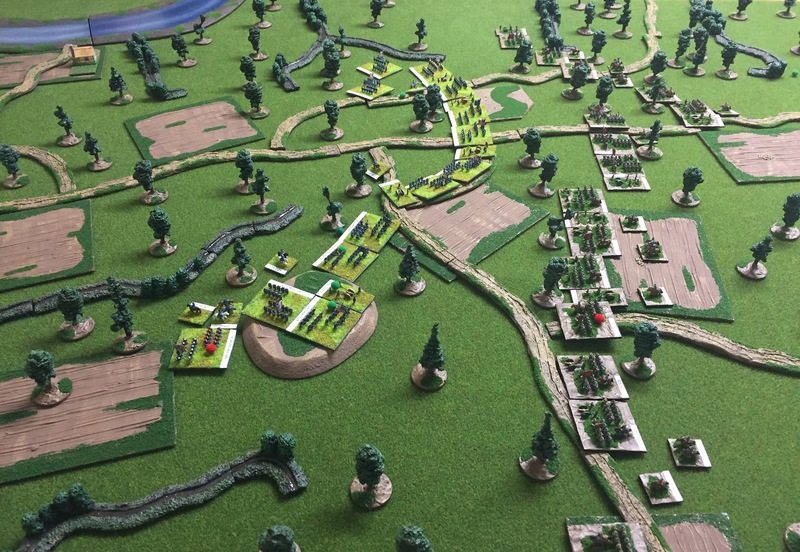 Meanwhile Union forces further north had been moving south with the aim of forming a defensive line lining the road that passed near Duncan Field east. This road was sunken in places and as such offered a degree of additional protection. Below, the general situation. The Union extreme right was held by McClernard’s Division who formed part of his division in a right angle, on a knoll, in an effort to prevent the Rebels attacking down the line. McClernard’s Division can be seen below. The Union brigade, left foreground with a red disorder marker, is the remaining brigade of Sherman’s Division. No sooner had the troops of McClernard’s Division deployed than Rebel forces arrived in strength. The angle of the Union line was, as expected, the focus of the Rebel artillery. For the next three hours 12 cannon, a mix of rifled and smoothbore pieces from Clark’s Division bombarded the Union positions, supported by Rebel musket fire. However, the Rebels were reluctant to assault the well formed Union centre which stretched from just west of Duncan Field to just east of Sarah Bell Field and the Peach Orchard. While Rebel troops deployed opposite, screened by woods, the Confederate commanders moved troops to the flanks. On the Confederate left Hardee’s Corps, effectively a division, moved around the Union right and advanced towards Tillman Creek. All that prevented a breakthrough here were the remains of a single brigade from Sherman’s Division. The Union position here looked fragile until Lew Wallace’s Division appeared on the Hamburg-Savannah road around 1.30pm. Grant planned to deploy Lew Wallace’s Division along Tillman Creek, the centre stream running generally north to south below, to block the Rebel flanking action. However, another threat was developing on the Union left. On the Confederate right Wither’s Division, from Bragg’s Corps, moved slowly towards Dill’s Branch crossing several streams that slowed the division’s advance. 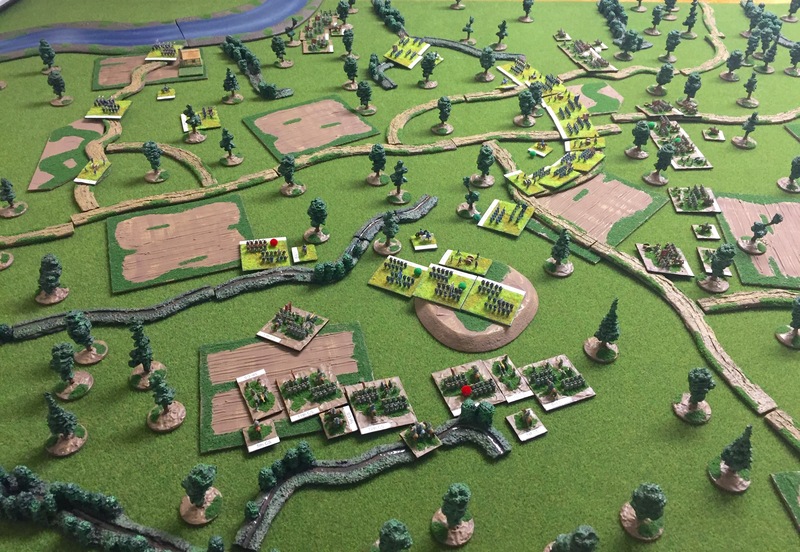 While two Union Brigades were withdrawn from the centre it was clear that Wither’s Division was going to capture the now undefended Pittsburg Landing. As a result Lew Wallace’s Division, the 3rd, was ordered to secure Pittsburg Landing. It looked likely 3rd Division would face attacks from two directions. Below, the Union 3rd Division arrive in Pittsburg Landing, next to the Tennessee River, in road column while Wither’s Confederate Division approach from the south. Dill’s branch separates them. 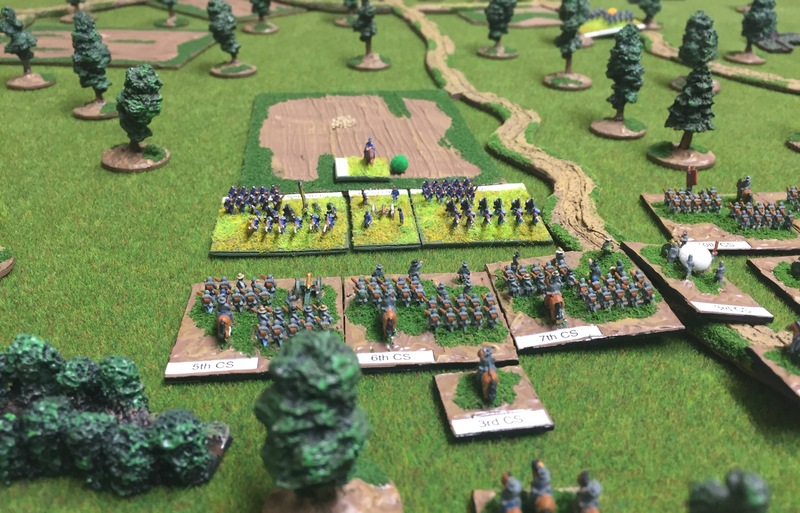 Meanwhile the Union Divisions positioned south along the sunken road were to undertake a limited offensive. Rebel brigades had throughout the afternoon continued to attack McClernard’s Division. These attacks were always limited and aimed at isolated Union Brigades. 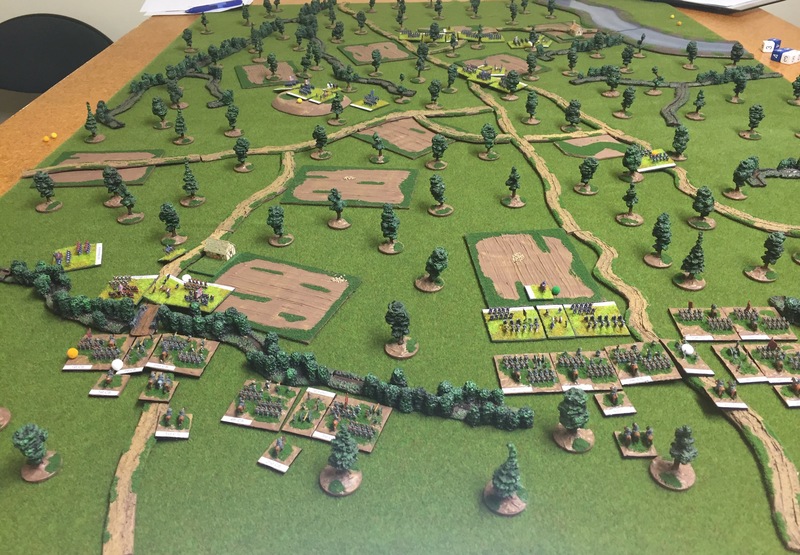 By 4pm an opportunity presented itself and two Union Brigades attacked across Duncan Field, shown below, towards Stephen’s Rebel Brigade moving west. Stephen’s Brigade, from Cheatham’s Division, is shown having retired from combat and is now disordered. Driven back soon Forrest’s dismounted cavalry were engaged. Between 6pm and 7.30pm more Union brigades advanced. Below, Bowen’s Brigade is attacked by Union artillery and Tuttle’s Brigade from WHL Wallace’s 2nd Division. Duncan Field is in the foreground, viewed from the northwest. However, it was at Pittsburg Landing that the decisive action would occur. From 5pm Rebels surged forward. 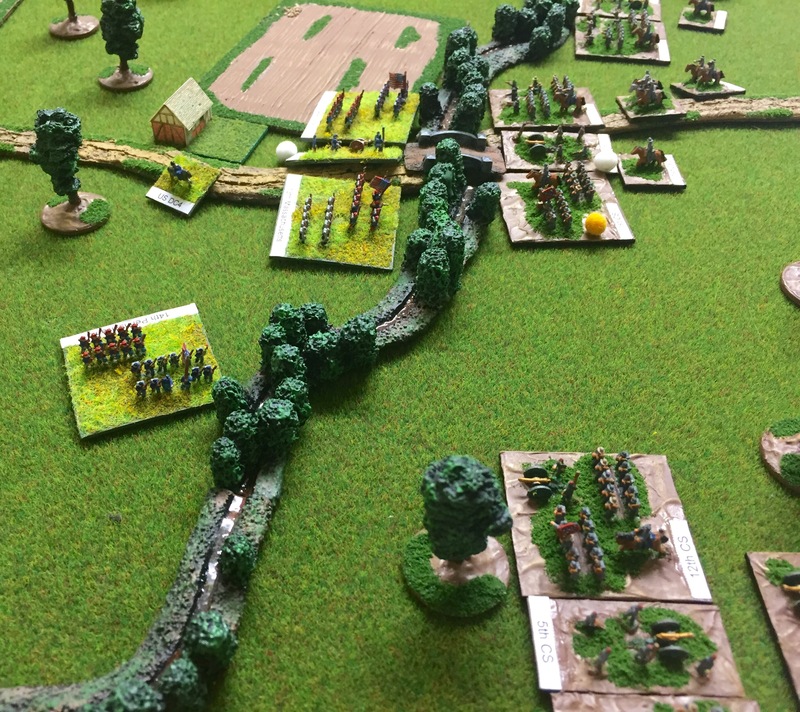 From the south Chalmer’s Brigade and artillery from Wither’s Division crossed Dill’s Branch and advanced on the landing. Simultaneously Rebel brigades from Hardee’s Corps advanced from the northwest. Below, the situation around 6.30pm. A Union brigade from the Army of the Ohio has just deployed providing critical reinforcements. The fighting surged back and forth with Beauregard leading attacks while Grant steadied troops. Beauregard fell mortally wounded directing one attack which despite his bravery was driven back. Below, around 7.30 as darkness enveloped the field two of Lew Wallace’s brigades, assisted by troops formed in an ad hoc brigade attempt to drive out Rebels of Chalmer’s Brigade. Both Lew Wallace’s brigades had failed morale checks yet despite this the last rebels were routed from the confines of Pittsburg Landing. The landing was secure allowing the movement of the Army of the Ohio across the Tennessee River during the night. The butchers bill had been significant. The Union Divisions of Sherman and Prentiss had been eliminated while McClernard’s had collapsed as a fighting force. Rebel divisions had also been decimated. Cheatham’s and Wither’s Divisions had collapsed, while Ruggle’s Division had been exhausted by the mornings fighting. Johnston ordered his army to retire, battered but operational. The scenario was played out on a table measuring 1.2m by 0.9m. The figures here are all from the Heroics & Ros 6mm ranges and are based at half scale. Each inch on table represent 200 yards. Union forces were from Jon’s collection while the Rebels are from my own. Very cool – that looked like a 3D boardgame without annoying hex overlays. Enjoyed this write-up immensely. Thanks Brian. I’m pleased you enjoyed the report. must have been a GREAT GAME ! Yes, it was thanks. It’s a great battle to refight with plenty of decisions for both the Union and Confederates. I’ve found modelling terrain for historical battles challenging. I’ve used customised battlefield in the past but these can be difficult to store. 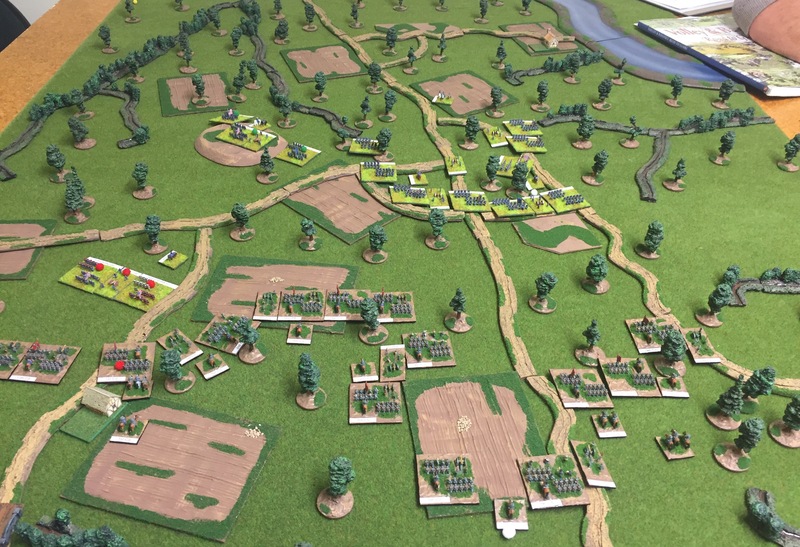 With more general terrain positioned for specific battles it can be difficult to get a stream or hill correct. That said I’m pleased with the result for Shiloh. As to scale I understand not everyone likes 6mm. I do for the reason you note.